What a whirlwind the last two weeks have been! It goes without saying that this year was by far the BEST National Sports Collector’s Convention yet for COMC. This year we saw eight COMC staff members make the cross-country trek to Atlantic City, New Jersey for the 37th Annual National Convention. 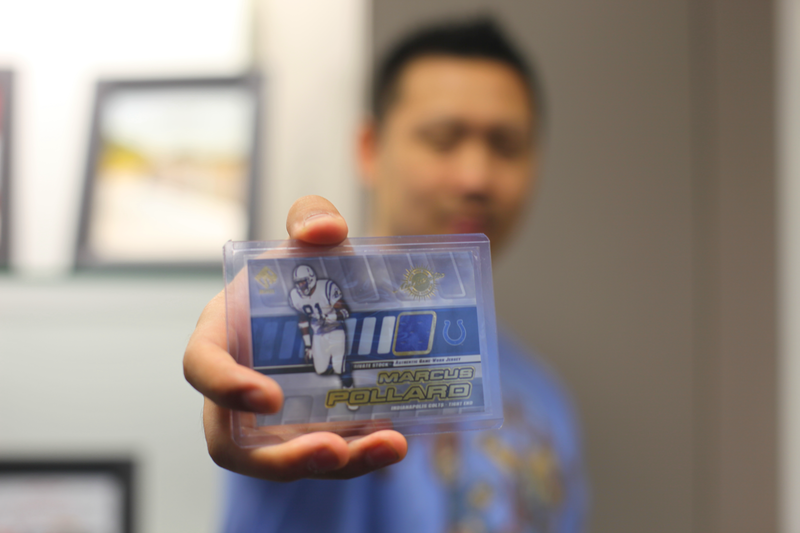 This year COMC had a booth in the corporate area with the likes of Upper Deck, Panini and Topps. Over the course of our five days at the convention, we met with hundreds of members of the COMC Nation who shared their thoughts, suggestions, and feedback with our staff! We also provided nearly two thousand 300-count boxes for collectors to fill up at the hundreds of booths around us. Even though we opted not to run a National Convention processing special this year, we accepted nearly a thousand pounds’ worth of consignment submissions. That’s a staggering amount of cards! In lieu of a processing special, this year we opted to run daily store credit giveaway drawings three times a day for a total of $400 a day, as well as a Grand Prize drawing of $500 at the conclusion of the Convention! All those in attendance at The National who had a COMC account were eligible to enter, and those who didn’t have a COMC account…well, let’s just say a lot of accounts were created! We ran four computer stations at our booth for convention-goers to browse the COMC marketplace, sign up for or manage their accounts, and even print their submission paperwork on the spot. Grant and Steve prepping boxes to hand out. The most iconic cards all under one roof. In their admittedly sparse downtime, our team was able to enjoy the sights and sounds of Atlantic City at night. Under the hot summer sun, they toured the Boardwalk, enjoyed popular local restaurants such as Kelsey’s (Soul & Comfort) and Angelo’s (Italian), and tried their luck at the local casinos! We want to thank everyone who stopped by our booth and contributed in making this year’s experience at The National the best one yet. We’ll be back next year in Chicago from July 26th-30th, 2017 for another great convention, and we hope that you’ll consider heading to the Windy City with us! No matter what you collect, there is nothing quite like the experience that is the Sports Collector’s Convention. Like the photos in this blog? You can view all of our National Convention photos on our Facebook Page! 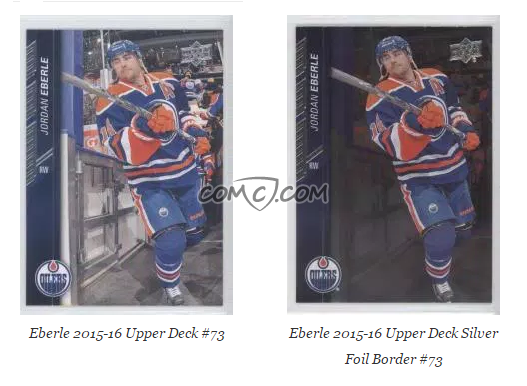 COMC is very pleased to announce that we have partnered with Upper Deck on the release of their e-Pack version of the 2015-16 Upper Deck Series 1 Hockey card set. We are working as the fulfillment center for this product, which allows us to leverage our extensive knowledge and systems to provide the best experience for thousands of new customers. We have already processed thousands of cards in preparation for this launch, and we can’t wait to start shipping them out to you. It can be a hassle to deal with the large quantities of base cards that can accumulate when ripping any amount of product. To cut back on this frustration, when you collect 10 copies of a digital-only base card, you may combine them through the e-Pack site for a Silver Foil Border. Similarly, some combinations of physical cards will allow for other exclusive cards like Young Guns rookie cards – including Connor McDavid! Starting today with the release of the e-Pack site, you can transfer from your Upper Deck e-Packs directly to your COMC account. The transfer is absolutely free. Once the card is in your COMC account, it is treated the same as any item that has been purchased into your COMC account, you can list it for sale, ship it, or even send it out for grading. 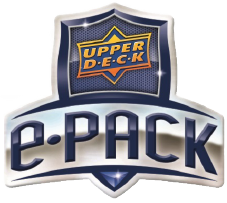 Fans can try e-Pack for free just by registering at www.UpperDeckEpack.com. Once registered, users can claim a free pack every day – just for logging on. More information, including detailed e-pack functionality, exclusive e-Pack content and a list of e-Pack achievements users can obtain can be found at www.UpperDeckEpack.com. Edit: 2/4 – Cards transferred to your COMC account act as cards purchased, not as cards consigned. Twenty million is a large number. It is just about the number of seconds in 231 and a half days. It is larger than the number of miles between where you’re sitting and the planet Venus at any given time. And, earlier this week, we identified card #20,000,000, and added it to our site. In this special edition of Check Out Your Cards, I am showcasing other milestone cards we have received, charting the growth of our inventory. 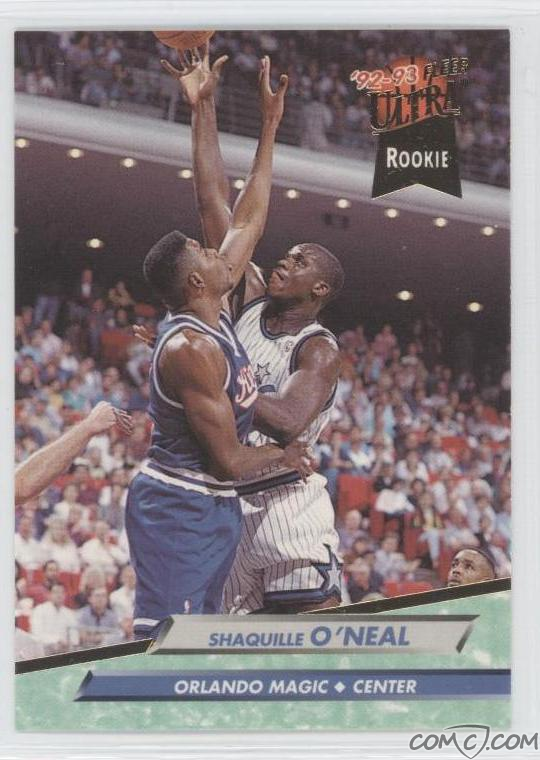 This Shaquille O’Neal card was added to our site back on 6/29/09, almost two years after Tim had started the project that eventually became COMC. In fact, the first consigned cards from someone other than Tim didn’t start rolling in until around card 69,000. After two years on the project, this was the first major milestone. 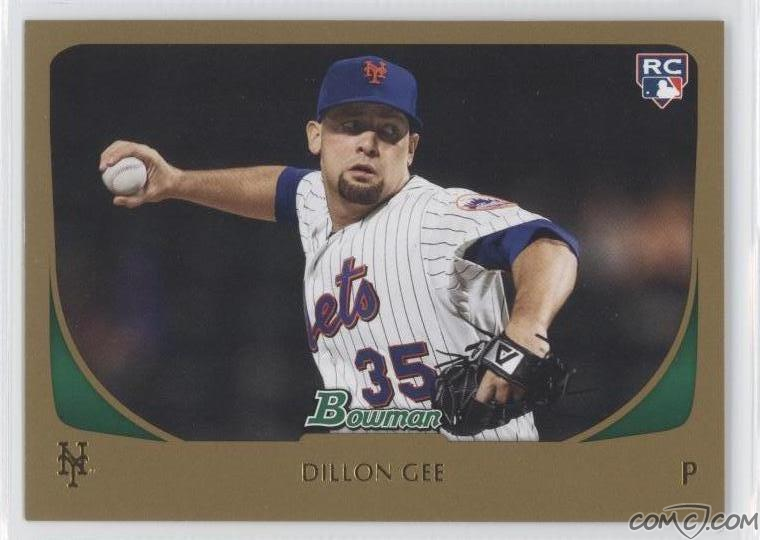 If submissions stayed at the same pace, this Bowman Gold card wouldn’t have been added until 2019. Thankfully, the wait was not that long. On 7/29/11, two years and one month after card one million, card five million was added to the site. When this Private Stock Game-Worn card first hit the site on 2/19/13, we called in A Towering Achievement. Going by the graphic we made at the time, our lifetime inventory. 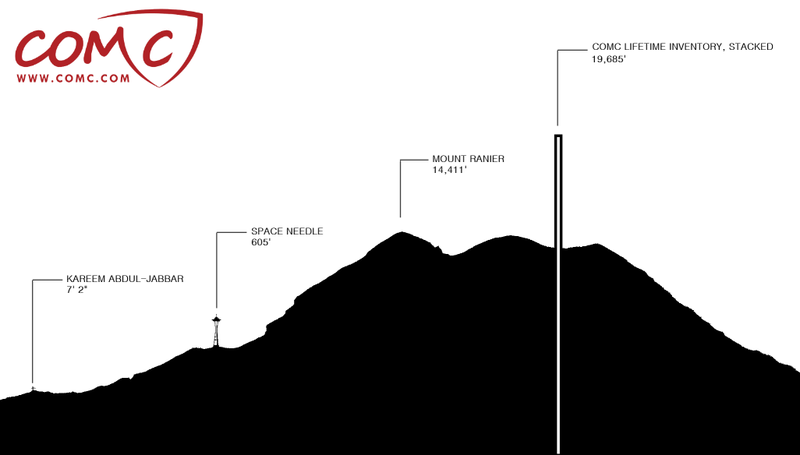 card atop card, would stack 19,685 feet into the air, about 5 thousand feet taller than Mount Rainier. All this in less time than it took to get from card #1000000 to #5000000. This Upper Deck MVP Pro Sign card snuck up on us, and we almost let it pass without much fanfare. It was added 7/11/14, showing that, even with having to build our catalog from the ground up, submissions were still strong. It took about year and a half to add an extra 5 million cards to the site. 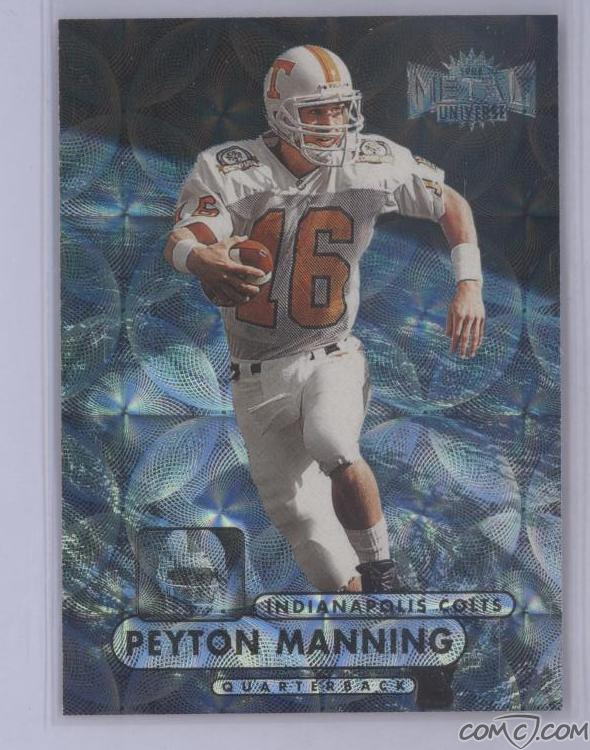 The trend continues with this Peyton Manning card. Added 8/26/15, a year and a month since the last major milestone, and only two and a half months after card #19000000, this beautiful Metal Universe Precious Metal Gems card is already far from being the most recently added card. It is now the second day since it was added, and we’re already getting card 20,045,000 ready to list. At that rate, expect item item #21000000 before the end of the year. COMC has crossed the line! The 10,000,000 item line, that is. On Friday, February 22nd we uploaded item #10000000 onto the site. 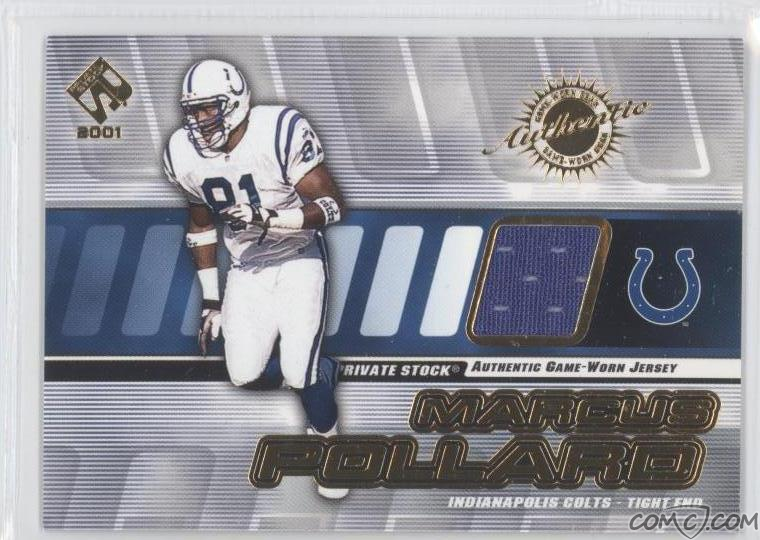 The card featured none other than Marcus Pollard, who played a season for the Seattle Seahawks in 2007 after many successful years with the Indianapolis Colts as a tight end. 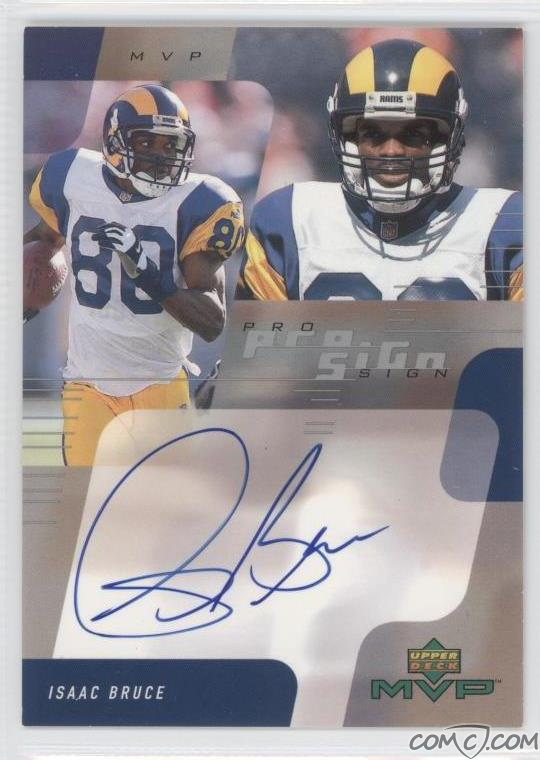 The specific card was a 2001 Private Stock Game Worn Gear #68 Marcus Pollard. 2001 was Pollard’s best year with the Colts; he averaged almost 16 yards per catch and scored 8 touchdowns. With over 2,500 sellers now submitting items to the site we wondered where number 10 mil would come in from, but we couldn’t have been more surprised to learn the consigner was from right in our own backyard! Seller john316 had dropped off the batch in person, driving down from Everett – just about a half hour away. We called him up to congratulate him and asked if he would be willing to come down to take some pictures with us. He graciously agreed, and so we were able to thank him and purchase the card from him personally. Tim gives john316 a check for the high book value of the card. “I never would have gotten that much for it!” quipped john316. 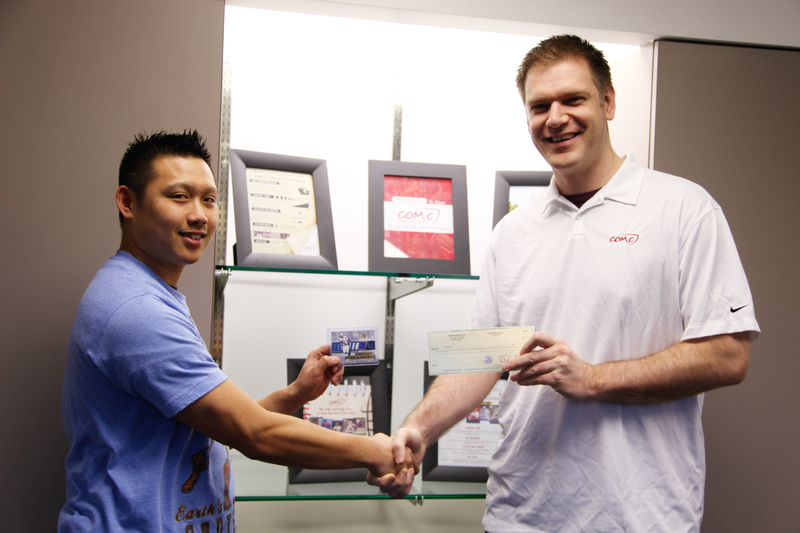 John316 was also awarded $100 in store credit for submitting item #10000000 as the winner of our countdown contest. Item #10000000 in all its glory. The closest guesser in our countdown contest was ivbaseball06 who correctly predicted the sport, and was off on the upload date by just one business day! Congratulations to ivbaseball06 who also wins $100 of store credit! Ten million is a huge number and hard to even think about. It’s amazing to look back on how far we’ve come together from the first few items that Tim uploaded from his personal collection. Thirty thousand buyer accounts, three offices, and two web address updates later, we still feel as if we’re only getting started. On March 1st we officially rolled out our second supported item: comic books. We’ve got even more updates and features in the works that we’re very excited to tell you about, but for now we just want to take a moment to thank everyone who made this milestone possible. Without the loyal COMC buyers, sellers, traders, and flippers, this simply would not be possible. Thank you for trusting us to care for your inventory, thank you for giving us constructive feedback to build on, and thank you for believing how big this little idea was capable of becoming. A towering achievement indeed, and it’s just the beginning. Let’s start with the good news: we are getting TEN TIMES our normal traffic today! This means we have the necessary traffic to reach our goal of increasing sales by 10 times (as part of the previously announced “Perfect 10 Black Friday Special”). As for the not so good news, as you may have noticed, there have been some site issues today. Please know that we are working very hard to resolve them all and expect to be fully up to speed very soon! Even so, please don’t hesitate to contact our Customer Relations Department if you need help with anything. You can reach us until midnight tonight at staff@comc.com or by 1-800-517-3540. Here are our Extended Customer Service Hours. Thank you for your patience!